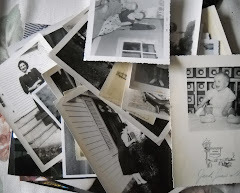 A COLLECTION OF FAMILY PICTURES, SOME OLDER THAN OTHERS, A PLACE TO START FIGURING OUT MY FAMILY TREE. HEY, HOW DID THAT FUNNY LOOKING GUY GET IN THERE ? A cousin, Rosemarie, shared this photo a few years back. She has passed away a year ago. The photo is of her baby brother Gary. He lives today in an institution with autism difficulties. 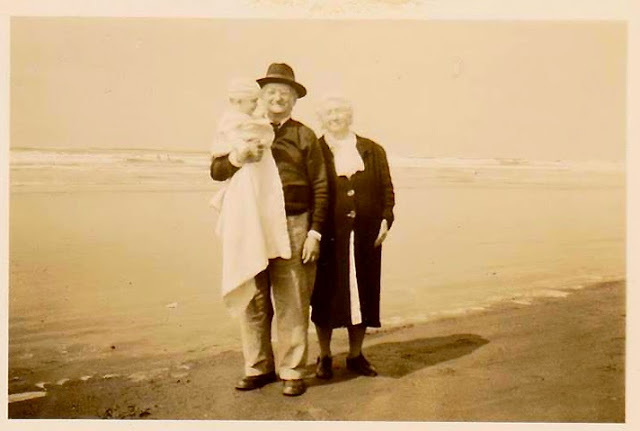 The photo then is about 60 years ago and it is taken next to the Pacific Ocean. 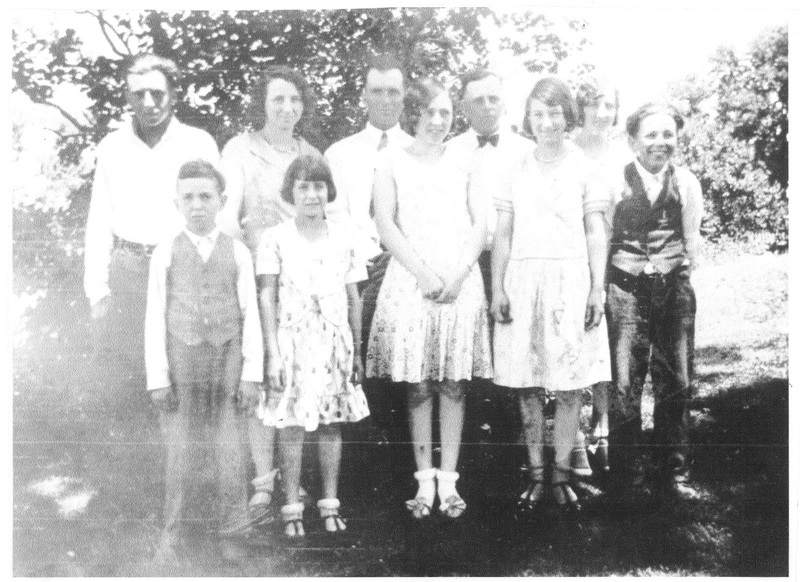 The finding of this photo is a special one to me as there is so much family stories in all that is showing in the photo. 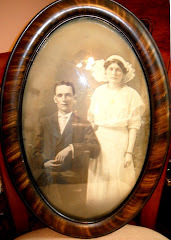 My Grandfather Charlie and my grandmother Grace lived in Iowa in a very small town. They took the train to Washington State to see new grandson and the grand daughter Rosemarie who would have been three years old. Their son Donald and his wife Eileen lived out in Washington. Eileen was a war bride being a full Brit. Charlie and Grace look so out of place being on the beach. I doubt that they had ever visited the coast before then. Living in Iowa they would not have had a car nor would they have made the drive. The two of them were at the end of their years having raised 10 children and living some very hard times as farmers. They lost a farm from a bad economy and struggled on a smaller farm to keep food on the table. The picture was taken in early 1949 when Gary was born. My grandfather died that same year. I never knew him as I was born in the next year. I have a few select photos of him and heard stories of how nice of a guy that he was. This photo is a great one of Charles (Charlie) Thomas Burgus. It is one of my Grace Elizabeth Turner Burgus and it does resemble her as I did know her for another 15 years since the photo was taken. My second and last photo shows thing in my life in the future. 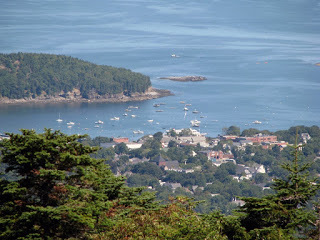 Our son and his wife live near Bar Harbor, Maine. This is a photo from Cadillac Mountain looking down on the Atlantic shore line. Our son and his wife love it here as they hike the trails and camp along the coast line. We are so landlocked here and thing they are so fortunate to live there. Others are answering the call of posting Sepia Saturday articles following the seashore theme. Check them out at the SEPIA SATURDAY site. 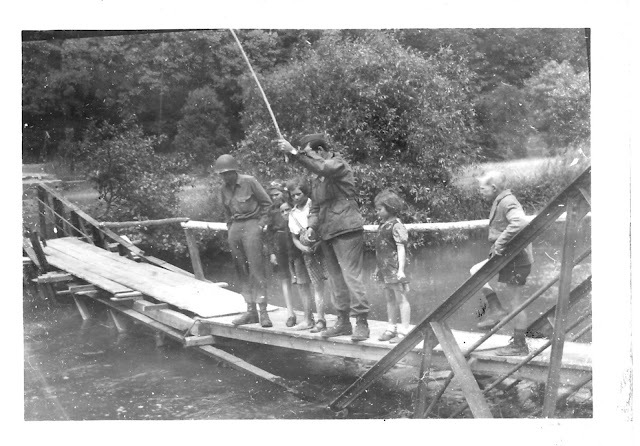 A couple of G.I.s trying their hand at fishing with the local kids. The place is Belgium where my dad was stationed before he went to the front to fight in WW II. The bridge looks like a temporary one after the original was damage by bomb warfare. Crossing the river by boat because the bridges are gone. 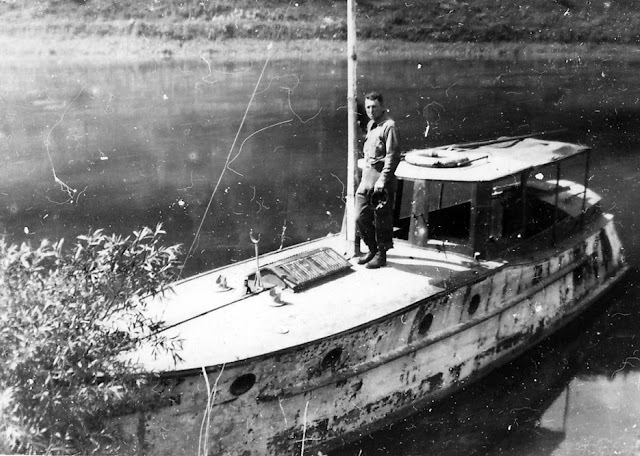 My dad was a farm boy in southern Iowa where there were bodies of water for boats. 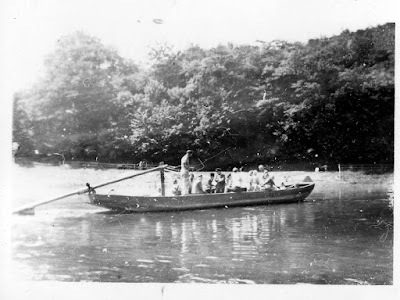 He then had a fascination for them and was fortunate to by a fishing boat is his older years thirty years after being in the war. My father is exploring another vessel in the same area of Belgium. I see there isn’t a sail to go with the mast. I like the little roof piece that is covering a portion of an opening of the boat. My dad took a shot of one of the smaller boats in which he two traveled in to come over to Europe. The smaller the boat the worse it is to get sea sickness while being on the ocean. He was extremely sick from that crossing in 1944. The theme was a boy with a wheel barrow with fish to eat in it. My extension to things in the water is a far stretch but I really wanted to share something today. 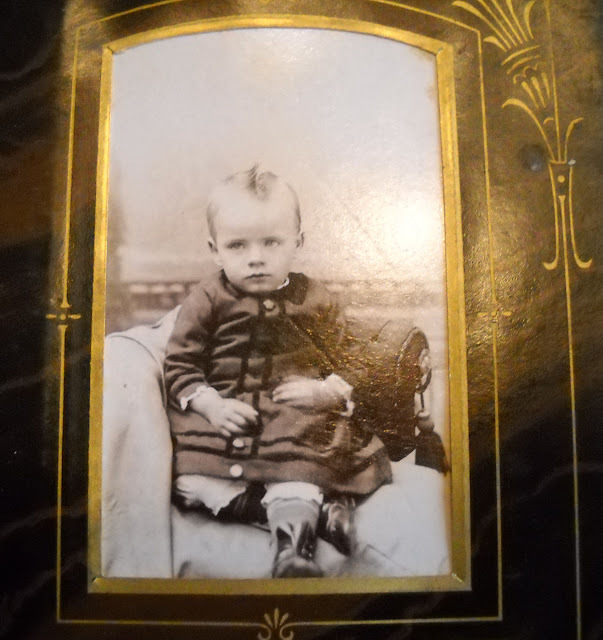 WW ll era may have been in the same time frame of the little boy at the harbor. 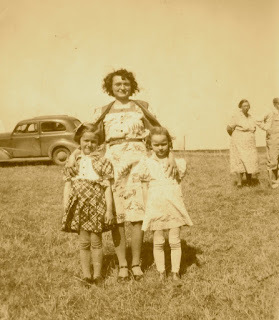 Others share photos on their Sepia Saturday’s blogs. Click on the HERE to go see other sharing of photos and words. It may be a wedding dress but I have no proof. I do know that it is a dress that is duplicate of my Grandmother Brooks’s wedding dress. The layers of the ribbons allowed the woman to shorten it to make be a custom fit. They could hem them up into the inside or the could cut it. The photo was taken in the late1800’s and was from a set of family albums. I have two albums from a house that my father demolished in order to build an new home. 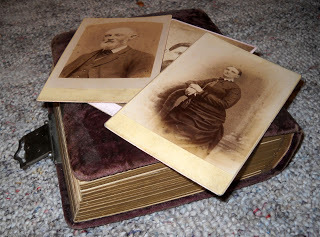 The photos from the family have given me clues that the house was built in the late 1800’s. The town was Osceola, Iowa established in 1870s or earlier. From the photos I have found a dominate name of Webster in which there are many of the family buried in the town cemetery. 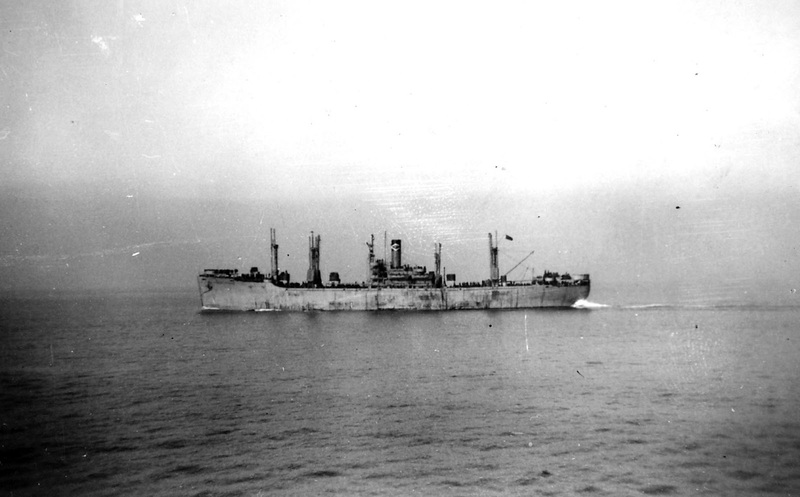 I have a photo of this in a rectangular format but can not pull it from my Sepia Saturday posts. 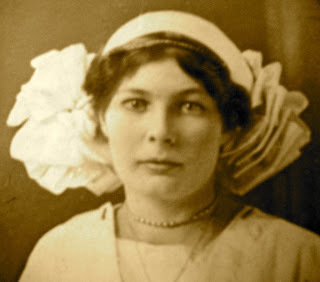 This is my Grandmother Mable Zella Wheeler who married Leroy Brown in July of 1913. She became my Grandma Brown. Leroy Brown died in 1937 and a few years later my Grandmother remarried a widower and became Mrs. Oscar Brooks. My Grandma had a photographer help her to get that ribboned hat to look good. I still have the ribbon hat and wedding dress which I am planning to give to a younger first cousin soon. 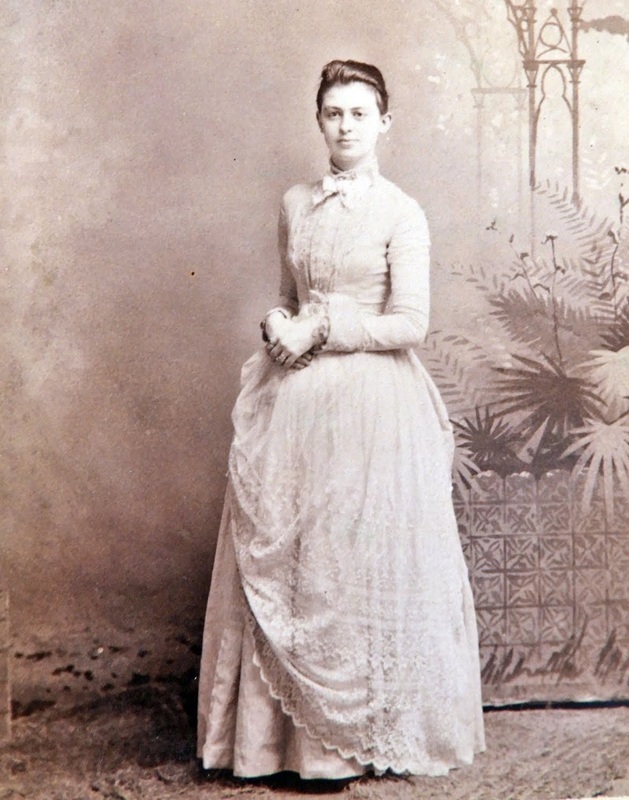 Other photos from the album gave me images of dresses but not necessarily wedding dresses. The style of dress does make it look to be a newer styled dress with the drapery on the skirt. It is definitely not a wedding dress but is at the photo studio with all of there street corner props. 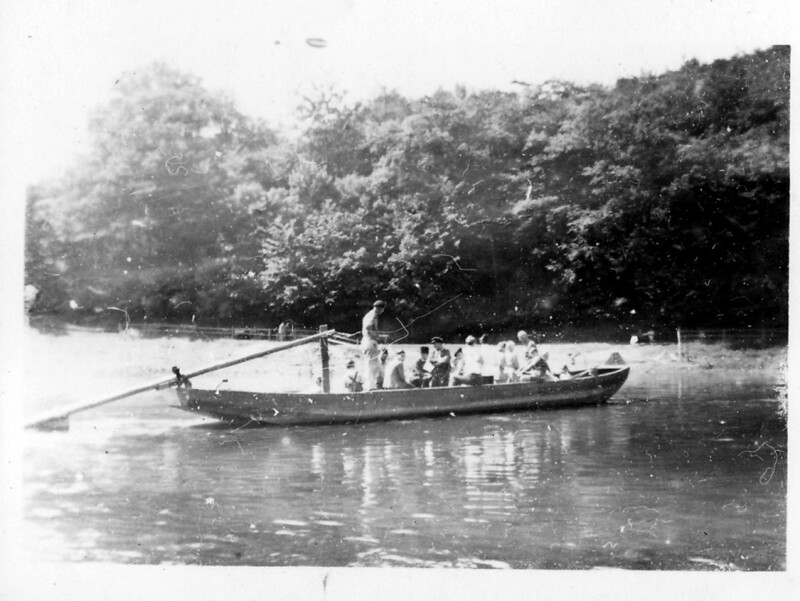 Probably this is more of the early 1900s. Things are more complicated with this dress than the original ribbon dress that I started out with at the top photo. The diamond shapes and patterns at the bottom of the double ruffled makes it more complicated in design. In the photo albums I did notice that the studios have lots of combinations of props in which for them to take photos. I have a couple that have a stairway included. 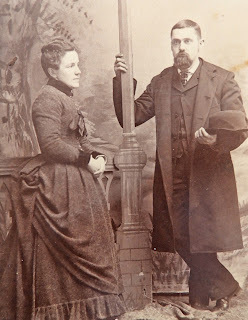 The last photo I share today is one of a couple standing on the fake street corner. The dark colored dresses were popular but the guy even has his top coat on along with his hat. The drapery on her dress is a little bit more complicated as the style developed. Visit others who are following this same theme today of Sepia Saturday by clicking here. Thanks for stopping by today. My son seems to be pretty serious playing his sax in a high school Jazz Band performance. 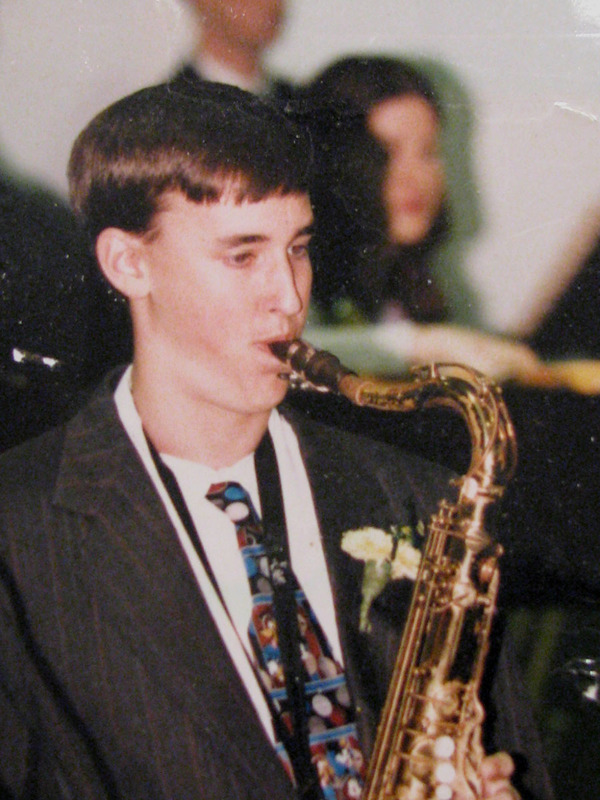 His group won a lot of competitions as he worked through his four years in band. I am thinking the year is 1997. Kids love school picnics and these two are having their picture taken with their country school teacher. My mom is the teacher and the year must be 1939. I like seeing the old car and a concerned parent or grandparent looking on as the photographer was snapping the picture. Even thought is says it is 1956, I am betting the photo was taken in the fall of 1955. 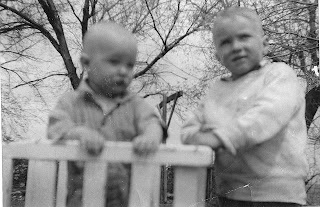 I am standing there at the age of five with my brother, Dwight, named after one of our presidents. Dwight, 7 years old, has a good bike there but I didn't have one at the time. 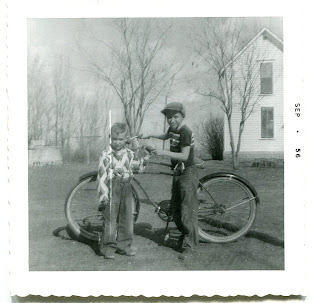 I really didn't learn to ride a bike for another couple of years later, when my dad brought home a couple of beat-up old bikes from a farm sale. We had a hill in the back of the machine shed and I learned to coast down it and eventually pedal. I like seeing the hand-me-down pants and shirt that I am wearing in this photo. My age difference to my brother was three years so his clothes really were too big for me most of my childhood. I did have the privilege of having my own underwear and socks. Living on the farm meant having lots of pets. The cats were continually reproducing and the dog Tippy lived long after I was in college. Tippy was mostly border collie with some other mixture added to his breed. We got the dog in 1954 and he was still around in 1970. I am thinking the ages of the boys, this summer shot, no shirts, is four, seven, thirteen, and twelve. Leaves on the old locust trees in the backyard and the Chinese elms are standing strong as a windbreak for the old house. 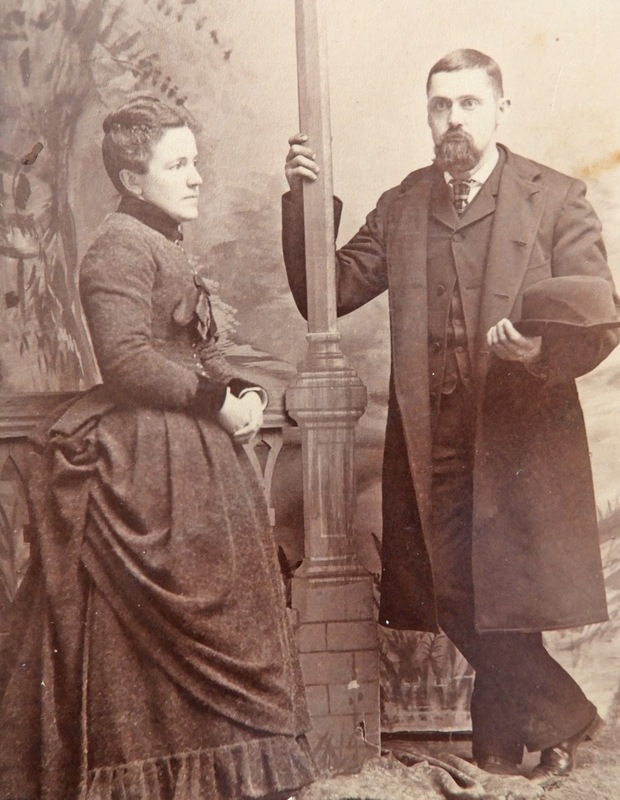 This is a photo from an album that I have full of family shots. I now know that the house they were from had owners by the names of Webster. I don't have much more to find among the photos. The youngster doesn't look too happy having his photo taken. If it were a photo where he had to hold still, it may be why he is so stern. Visit other bloggers in Sepia Saturday postings by clicking here to see their blogs. Tractors and bicycles have some things in common, but not too many when you think of all of the differences. Wheels make them belong to the same big family. My brother was born in 1942. He sits on this tractor 74 years ago. 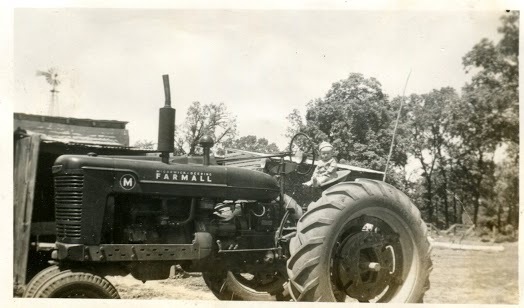 A Farmall M, which must have belonged to one of my uncle,s as my dad was in the service at that time and didn't become a farmer for five more years. Carnival rides really don't have any bicycle in them and yet there are all those wheels. A classmate of mine in school shared this photo of her family on the ride, going in circles of course. The think that has always fascinated me about this photo is what is in the background on the left. The year this was taken has to be in 1953, judging by the age of the littlest girl whom I still know today. The carnival is set up in a park right next to the train track in Murray, Iowa. A first cousin of mine also is proud of his wheels. Unfortunately for him, he drowned within the next year. Keith was an only child and was probably close to being 15 in this photo. He and his friends ran off to swim at the Thayer lake. His parents, my uncle and aunt, did not know he was even gone until they told them of his drowning. This photo is also taken on a main street in Murray, Iowa. I can only guess that this was taken in 1936. The wheels of misfortune that helped to cause his death was said to be bicycles that took out to the lake. I don't think he was allowed to drive this family car. 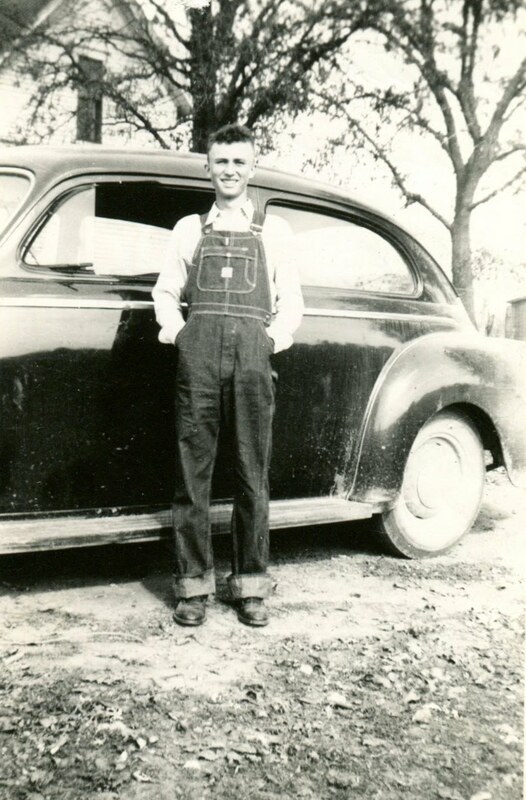 Uncle Kenny was a dashing guy as he grew up. He is proud of these wheels. 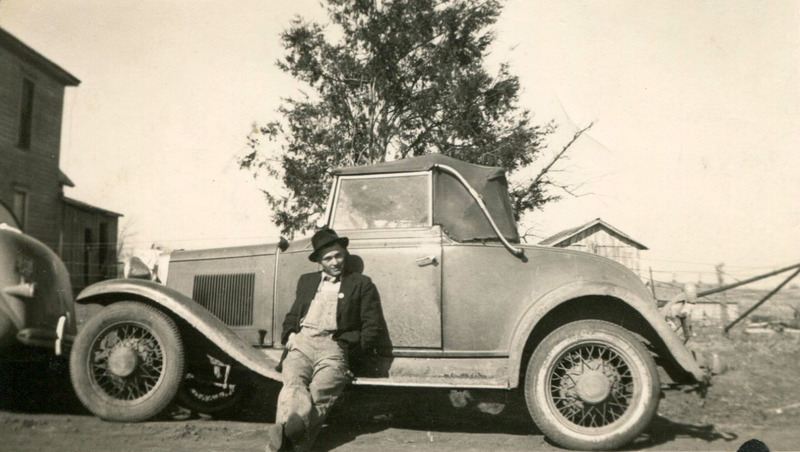 He sits on the running board of a car sitting in the yard of my great grandparents, near Macksburg, Iowa. Those who know anything about American cars can probably date this photo. This guy was born around 1916 and had not gone off yet to be in the army for WW II. I am guessing 1938. Southern Iowa farm boys leaning against the Ford not even thinking of their futures. 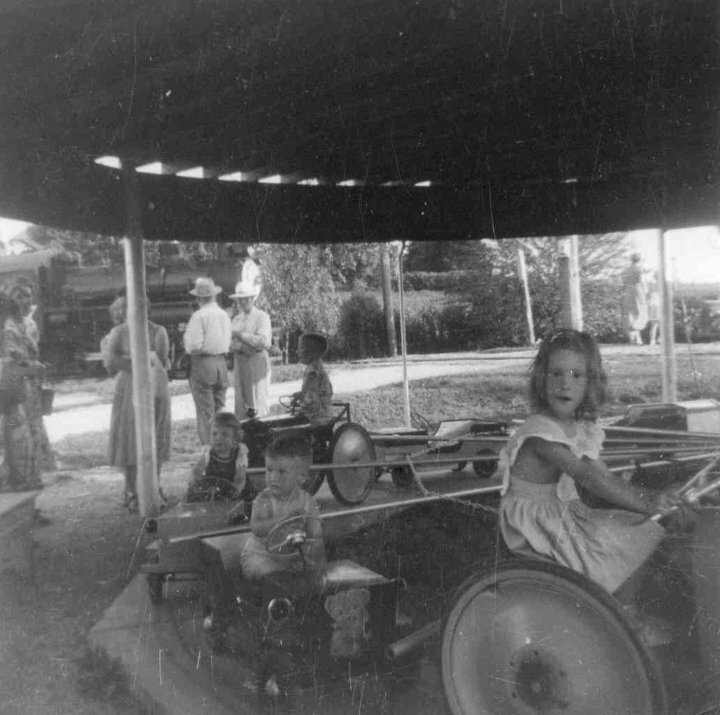 They were leaning against the one set of family wheels. 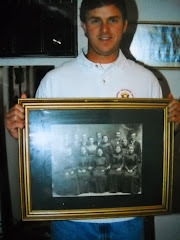 I am the youngest here with my older brother to the left of the photos. Second older brother is the tall one and my brother, three years older, is on the far end. The year is 1956 and we have been on this farm since 1953. The guy on the left is the guy that was sitting on the tractor in the very first picture. The weather was probably middle summer as three out of four were without shirts. We were poor but we did have undershirts that we could have worn. The two youngest guys probably didn't wear shoes most of summer until school started. The photo was taken with the Brownie Kodak camera and you are seeing the photo that is being held in a packet of photos as was the way photos were process then. The fortunes of these four guys were all different with the two older guys now live in warmer climates. The older brother is in Arizona and the other is in California. The brother on the end died in 2008 from additions of his past. He had lived in Arizona and returned to Iowa for about 15 years before he passed. He was 61 yeas old unlike the age of 9 that his is at the time of the photo. 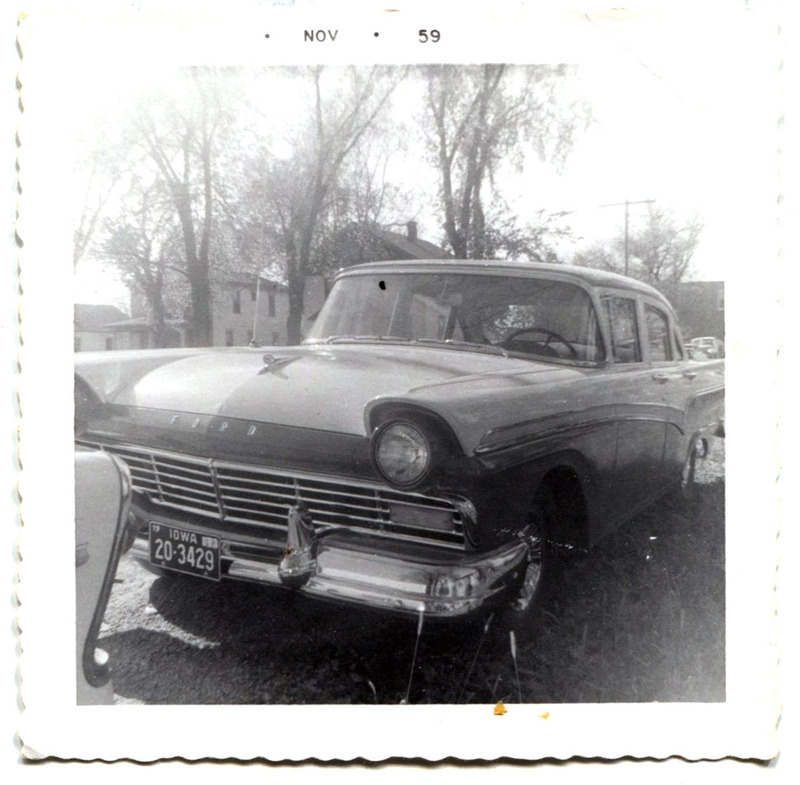 I will close with the photo of our 1957 Ford Fairlane. It was green with a cream color. 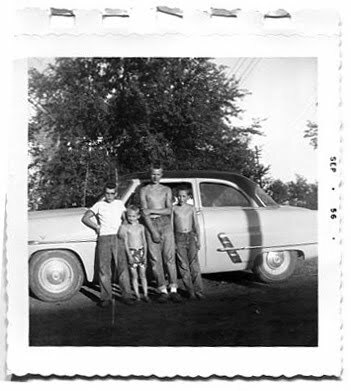 It seemed like a beautiful car at the time and we took family trips in it to the great out west in the summers. No air conditioning in this car other than rolling down the windows. The heater did work in the winter. This is the first time that I have seen in the photo tail fin of a 1976 Plymouth of a relative of the family. As others create blogs for Sepia Saturday you are able to see their entries to this group themed blog. CHECK them out by clicking HERE to see what people are sharing from all over the world. 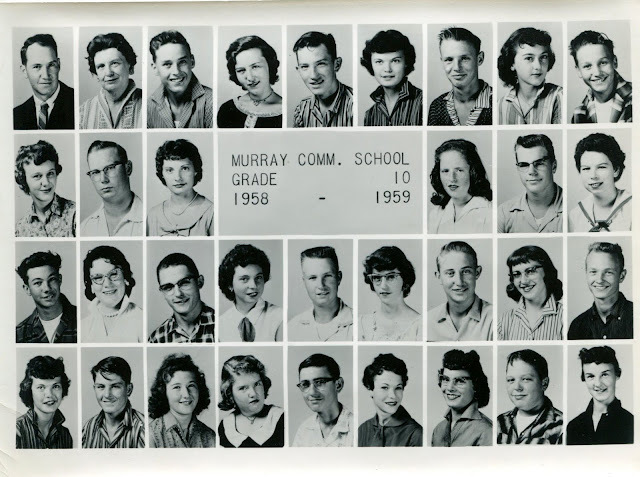 Shown here is a small group of school mates of 1959. 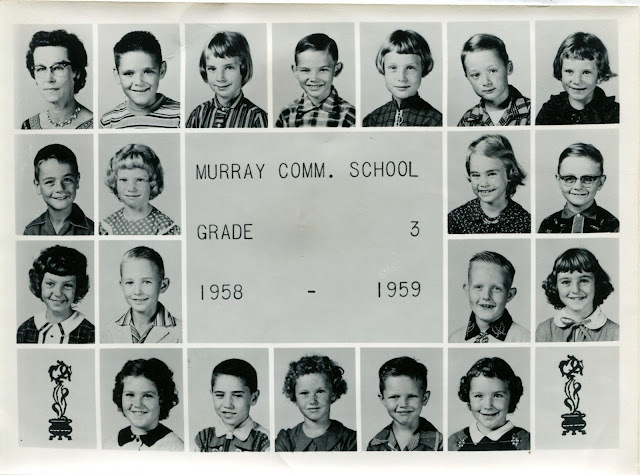 Due to the necessity of making students exercise, the students all eventually had to take physical education classes when they entered the 6th grade. Up until that time the lower grade students had recess to help with their exercise program. Playing soccer, or chaise would get one winded but swing on the swings and jungle gym was a low grade of movement. Playing tag could get one into a good run as people would scatter all over the old school grounds. One who went out for the sports like football, basketball and track did get more exercise than the ones who did not participate. At this time a majority of them lived on farms so they did get to do farm chores and work as farm kids in the summer. Jumping back in time the students of this day,1920s, were lucky to have finished eighth grade at a country school. There was not time for physical education back then even though health would have been taught. The older kids of this family did go to a town school and graduate. 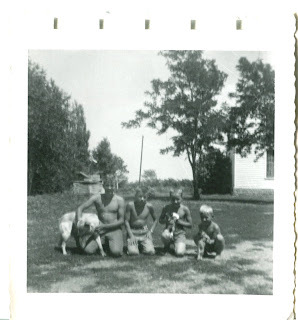 The youngest boys in this photo never attended high school but were home trying to help save the farm from foreclosure. They didn't save the farm but all of that added to their character. Those two boys ended up being in WW II, traveling far away from their farm roots to Europe and Aleutian Islands. Check in on others who are participating in Sepia Saturday this week by CLICKING HERE. Many responses to a prompt with creativity exposed to the public. I found an old newspaper article cut from the Sentinel-Tribune paper of Osceola, Iowa. It was first published right after the end of WW ll. 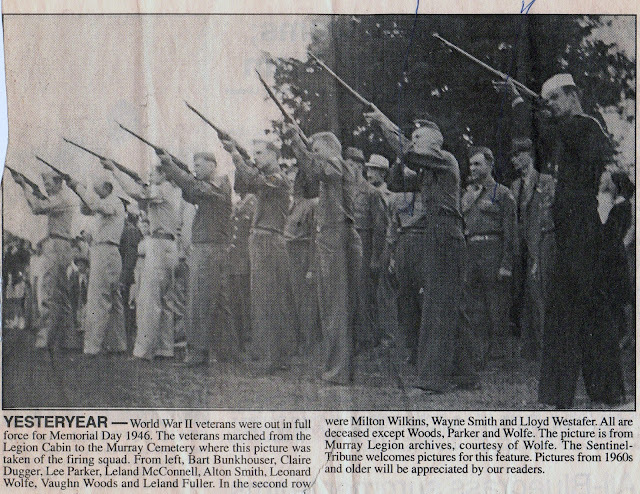 All the local men who returned from serving during the war were asked to show up at a cemetery in Murray, Iowa. There the seven guys of various services fired off a 21 gun salute. The names of the guys described in the row are all familiar with me. When the article was republished years later, the paper said all were gone except for three men in that front row. My dad must have been alive at the time when the republished it. The reason the article was cut from the paper was not for what you see but for what you don't see. Jesse Burgus, my dad, is standing behind the second shooter as was marked with an arrow by a blue pen. His brother, my Uncle Donald is in view with a blue line marking his existence. Both guys were in their early 20s in age as later they neither one would be able to fit into the uniform. They were wool uniforms. I tossed a lot of my parents things but this is a fun one to have. In the past I had this as a header for my Sepia Saturday blog. These kids were all children from a country school in 1939. My mom was their teacher. When I posted more of these photos on my blog I was contacted by a woman, my age, searched on the blog and asked me about one of the photos. She said one of those girls was her mom. I sent her the photo and scanned pictures of the whole country school crowd. 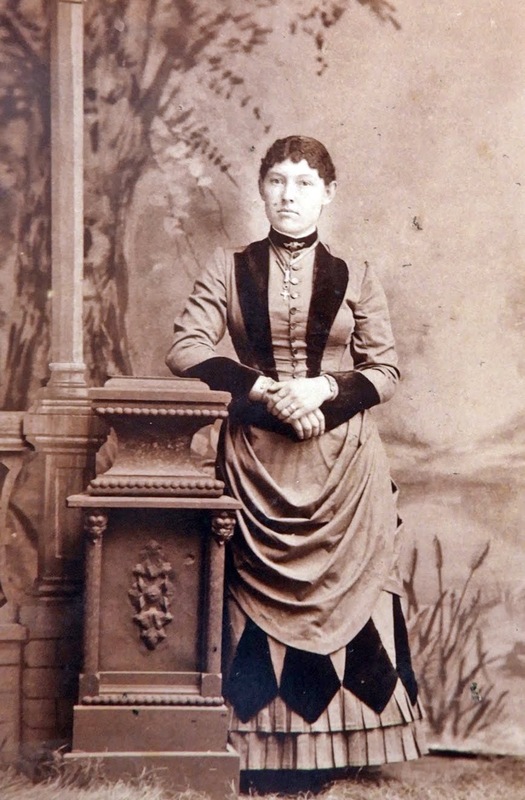 The woman wanting the photo ended up being one whose mother was related to the an Aunt of mine, who was married to my Uncle. She also had lived in the town and graduated from the school that I had been working in for 31 years. Small world, curious sharing of first cousins and we were not related ourselves. While fishing for a photo of the past that would fit the theme, I found this one. 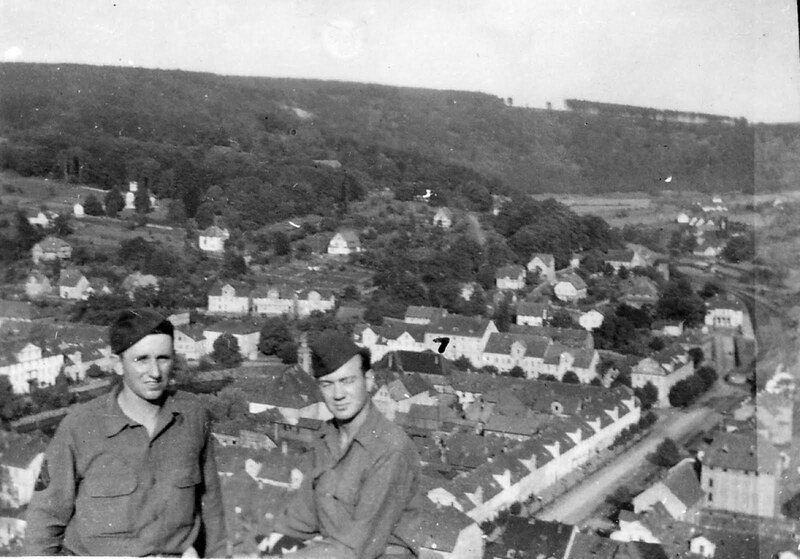 It is one of my dad's photos taken while he was stationed in Belgium during WW ll. He is not in the photo but it shows two soldiers getting in on the fun, trying to catch a fish, while the local children are all so very entertained with his work or should I say play. The bridge they are on is a makeshift one as you can see the original bridge is collapsed in the foreground. 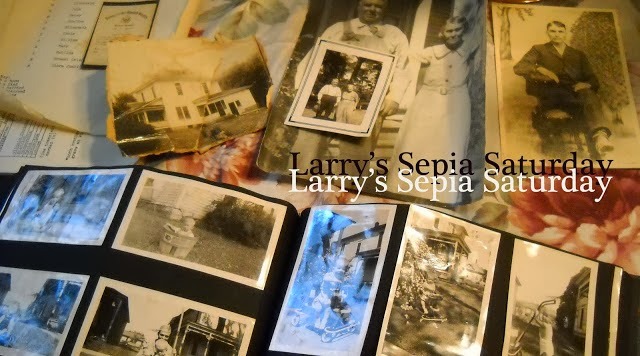 Check out others who are writing and posting for Sepia Saturday. CLICK HERE AND SEEK the creative blogs of others. Click on the photo to check out another of my blogs! 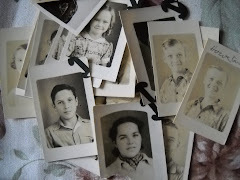 The task at hand, as we dig for more old photos and search for answers to the unknown and known family members. Oval frame, painted similated wood frame with convex glass. Click on the picture for a visit. I am on the hunt for a coveted photo by family members. This is a photo of my nephew holding a premium picture. I will find the cousin Patty who may have this and make copies. They were my mom's kids when she taught school.